Meridian is a good example of the modern English dessert apple, and an excellent choice for the garden. It is unfortunately not that well known, and deserves to be more widely-planted. 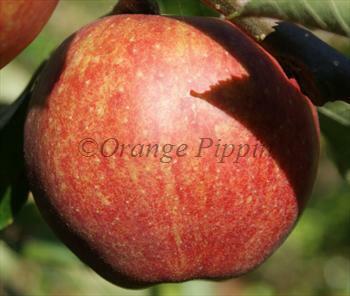 Meridian is a cross between Cox's Orange Pippin and Falstaff, and inherits the best qualities of both varieties. Meridian is a notably juicy apple, typical of Falstaff (and other varieties descended from James Grieve). The flavour is very good, with plenty of sweetness but a good balance of sharp acidity as well - this is a variety that will appeal to most tastes. Please fill in the details below and we will let you know when Meridian apple trees are back in stock. Falstaff is one of the parents of Meridian, and has a similar flavour. Meridian is in flowering group 3. Meridian is self-sterile and needs to be pollinated by another tree of a different variety nearby. Since it flowers in the middle of the blossom season it can be pollinated by most other apple trees. Developed at East Malling Research Station in Kent during the late 20th century as an alternative to Cox's Orange Pippin - which is one of its parents. However in many respects it is closer to its other parent, Falstaff.